This week during testimony, Alan Grayson questioned Ben Bernanke on the disappearance of $500 billion this past fall. To help you understand what they are talking about it is a process called "swaps" where Central Banks will exchange one currency for the other. "Which banks received the money?" Do you think that $500 billion could have been helpful to our economy? The everyday working people? Four people have asked me during this week if I saw Obama's speech the other night. I just don't know what to say to people. I want to shake them, to wake them up. $500 billion was printed out of thin air and given to foreign central banks. The decision was made by 12 representatives of the Federal Reserve which is a private business, a private for profit bank. Who owns this bank? Who collects interest on the money that they print and lend to us to survive? We will never be allowed to know. My guess is that some of them live overseas and could have benefited greatly from the $500 billion in printed dollars they received while Americans suffer everyday. Another four hours of testimony today from Ben Bernanke. Mostly boring chatter coming from the political talking heads. The only highlight of the event comes from Ron Paul. One of the only politicians who was warning about the financial problems before they arrived, and the only one that has an understanding of where we go from here. Bernanke and Paul's conversations are particularly interesting now because Paul has a Bill moving through Congress to audit the Fed's balance sheet. Bernanke has continued to do everything in his power to discourage the bill from passing. Its almost like watching a battle between good and evil. Bernanke finishes that interview by stating that M1 and M2(measures of the money supply) are not growing rapidly. Here are the recent updates on those two charts through this week. As you can see they are exploding upward. "Under the worst of circumstances, the report said, the government's maximum exposure could total nearly $24 trillion, or $80,000 for every American." Now, before we continue it is important to understand what that number means. The government will never have to raise that amount of capital. So the question is, how much of that $24 trillion will the taxpayer have to come to the table with. Lets take a look again at Fannie and Freddie. If we as a country now own $6.8 in mortgages and mortgage guarantees, how much of that do you believe will end up as losses? Well, that depends on your outlook of the housing market. My personal outlook is that the housing market is headed toward oblivion. 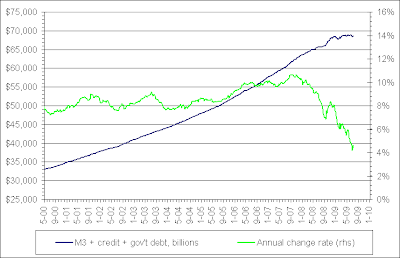 But lets take a more "optimistic" view and say that the value of that debt only falls by 10%. That means the government will have to raise $680 billion to keep Fannie and Freddie solvent. That is only one half of the story, however. Right now the only person/investor/business stupid enough to lend money to Americans to buy a home at these interest rates is Fannie Mae and Freddie Mac. The government has now become the only lender. It is for this reason that the Federal Reserve announced in March that it will be purchasing $1 trillion in mortgage backed securities. 1. You go to your bank to get a loan for a home. 2. The bank lends you the money and then sells that mortgage to Fannie Mae or Freddie Mac for a fee. 3. Fannie Mae or Freddie Mac then sells that mortgage to the Fed, and the Fed holds that mortgage on their balance sheet. This is how these government lenders will stay solvent. It is also why when Ben Bernanke told Ron Paul this morning during his testimony that he has no intention of "monetising" our debt, it is a laughable notion. He has already told us he will. Along with the $1 trillion in mortgage purchases he announced in March, he announced the purchase of $300 billion in treasury debt. Both of these amounts are down payments. If the government wants to keep the housing market from imploding they have to keep buying the mortgages. This means that Fannie and Freddie's balance sheets will mushroom to close to $10 trillion in the coming years. HEADLINE: "From left field, Brazil, Canada pull money out of Treasurys"
"Brazil and Canada were among big sellers of Treasurys in the latest month for which data is available and the previous year, catching analysts off guard and raising speculation that quieter nations may be concerned about investing in the U.S."
This means that while Obama continues to pile trillions on our backs with new spending, and tax receipts continue falling rapidly as the economy disintegrates, our foreign lenders are slowly stepping away from the party. Much more on that to come. Back in 2002 and 2003 our country was coming out of a recession. It was a recession brought on by the bursting of our bubble stock market, the dot.com bust. During 2002 and 2003 the prices of many goods and services fell considerably. However, the money supply was growing at an exponential rate during this period. So the question is, if the price of many goods and services was falling, was there deflation during 2002 and 2003? No, there was disinflation. Deflation is a decrease in the money supply relative to goods and services. Inflation is an increase in the money supply relative to goods and services. Prices rising and falling are not inflation and deflation. These are symptoms of inflation and deflation. When inflation is created it can go two places: Assets or the real Economy. During the previous two decades inflation has found a home in the stock market and then the real estate market. Assets. This is the good kind of inflation. The kind that everyone loves. The second place inflation can go is into the economy. This means it goes into the price of real goods such as wages, services, food, energy, etc. This is the bad type of inflation. This punishes the working middle class and the poor because wages are the last price to rise during an inflation. The poor have fixed income in the form of social security, pensions, etc., meaning they suffer the most during an inflation. So, there are two questions to ask when we understand this simple concept. 1. Is the money supply currently increasing or decreasing? As you can see the money supply has grown uninterrupted since the year 2000. 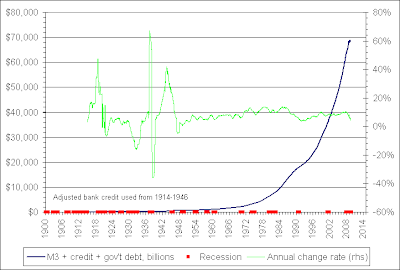 The truth is that the money supply has grown uninterrupted since the early 1950's. During this period there have been many periods when prices have fallen due to exogenous shocks to the economy, such as the massive one we felt last fall. 2. Where will the money go? The dirty little secret that the Fed won't tell you is that they can create an endless amount of new money, however, it is very difficult for them to control where that money will end up finding a home. It is like a stream of water making its way between the rocks. However, a study of history can help investors understand where that money is most likely to go. Since we have just come off one of the greatest stock market bubble (2000) and real estate bubble explosions (2006), it is very, very unlikely that one of those bubbles will be reflated. However, if you believe that we are in a deflation, then you want to be invested in cash and bonds. (Or be short the stock market) These investments perform the best during a deflation. Or you can go with option number three, betting that Obama and Bernanke will be able to blow up another stock market and real estate bubble. My money is betting against them, but it will be a show to sit back and watch them try. Fantastic. Its good to hear the truth even if its only a few minutes a year. 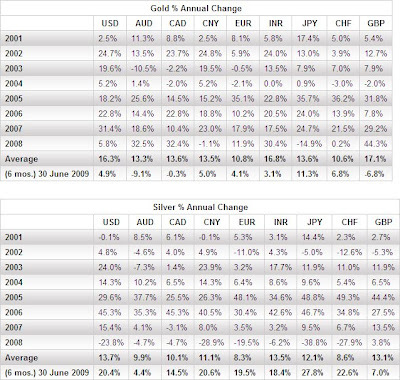 Here's an update on the Gold and Silver long term secular bull markets that began in 2001. The charts show each metal's performance in some the world's major currencies. The US dollar is shown in column one. Gold has risen 16.3% annually, while silver has risen 13.7%. The chart shows that the best investment strategy with the metals is to dollar cost average into the market every month. Do not pay attention to the hourly, daily, or monthly price. It is also important to remember that we have not even begun the optimism stage when the public first begins to enter the market. I have continuously stated over the past two years that I believe we will reach that point sometime in 2010. At some point the bull market will end in a speculative euphoria when the masses will enter as a herd. The most difficult part will be a few years from now when you have to decide when to sell. Right now is the easy part. Concentrate on the number of ounces of gold and silver you own. If the prices fall, that is wonderful, as it allows you to accumulate more.